The academic program is complemented by visits to global policy making centers e.g. International Energy Agency, UNESCO, and European Parliament in Strasbourg. The M.Sc. is academically broad in scope, with the objective of training managers who will be able to help companies face critical managerial issues involved with international expansion and overseas market operations. The goal of the M.Sc. Program is to assist students in developing their critical and analytical problem solving abilities as applied to business problems, while at the same time building their cross-cultural interpersonal skills. The M.Sc. 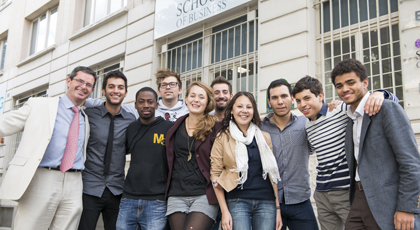 in International Management offers an interdisciplinary and cross-functional perspective, combining management studies with a broad understanding of the international economic and political environment. After completing the degree, students will be equipped with the tools to pursue international careers in multinational companies, NGOs, consulting, finance, government, politics, etc. Managers in Business Development, International Business Management, Purchasing, International Branding, in addition to consulting or Diplomacy. Candidates must have obtained an undergraduate degree (B.A. , B.Sc. , or equivalent).